An exciting ICZ Digital and Creative project saw School of Health Sciences lecturer Dr Stuart Porter and two undergraduate physiotherapy students, Sofia Gaspari and Gabriella Farrell, provided an anatomical perspective to a life drawing class on the human body and the way that it moves – with a world-class dancer as the subject. 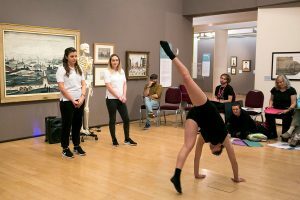 As part of ‘Under Glass’ a collaboration with Dan Whiteston, an artist and teacher, and professional dancer Alice Bonazzi from Clod Ensemble, they offered insights on anatomy in movement as members of the public tried to capture her on paper. ‘Under Glass’ is organised and funded by Clod Ensemble. Beginners and seasoned artists alike gained a new understanding of artistic, anatomical and physiological views of the body, witnessing up-close the extraordinary possibilities of bodies trained for strength and flexibility. Stuart spoke about about the anatomy and physiology of the dancer and how posture, gesture and physicality are affected by movement. The first part looked at static poses, where Stuart discussed the anatomy of static body/the idea of body as one whole unit. Part two addressed the moving human form and saw Stuart, Gabriella and Sofia giving insights into muscle actions and the anatomy of movement, what to look for and what to focus on. Dr Porter said: “We didn’t really know what to expect, but we had a great day and everyone got something out of it. Dr Porter said that physiotherapists are trained to examine movement and movement patterns, which forms a crucial part of undergraduate training and assessments. ‘However, this event was an amazing opportunity to see a professional dancer do things in real time that required extremely complex balance power and strength activities,’ he said. ‘We thoroughly enjoyed the day and what was particularly interesting was to listen to Dan, the art teacher, describe how the artists should literally look at the bigger picture of movement and posture rather than focusing on individual body parts.